Ma Nishtana (מה נשתנה‎) is also known as The Four Questions. 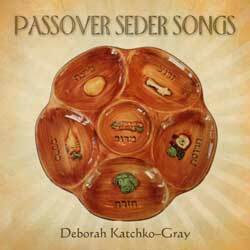 Recited by the youngest child at the table it evokes our own childhood experience and the pride we felt participating in the family seder. Mah nishtanah, ha-laylah ha-zeh,mi-kol ha-leylot? She-b’khol ha-leylot ‘anu ‘okhlin chameytz u-matzah, ha-laylah ha-zeh, kulo matzah? She-b’khol ha-leylot ‘anu ‘okhlin sh’ar y’raqot, ha-laylah ha-zeh, maror? She-b’khol ha-leylot ‘eyn ‘anumatbilin ‘afilu pa`am ‘achat, ha-laylah ha-zeh, shtey fe`amim? She-b’khol ha-leylot ‘anu ‘okhlin beyn yoshvin u-veyn m’subin, ha-laylah ha-zeh, kulanu m’subin? 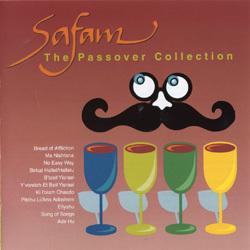 Dayenu (דַּיֵּנוּ) is a song of gratitude for all the gifts that God has given us. It is more than a thousand years old. Ilu ilu hotzianu hotzianu mimitzrayim, v’lo asah bahem sh’fatim, dayeinu! Ilu ilu asah bahem , asah bahem sh’fatim v’lo asah be’eloheihem, dayeinu! Di-di-yeinu! Di-di- yeinu! Di-di-yeinu! Dayeinu, dayeinu, dayeinu! Di-di-yeinu! Di-di-yeinu! Di-di-yeinu! Dayeinu, dayeinu! Adir Hu (אדיר הוּא) “Mighty is He” is a hymn traditionally sung towards the end of the Seder. Chad Gadya (גדי אחד) “One Little Goat” is a playful song popular with the children. 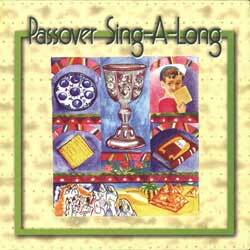 It is sung at the end of the seder. Dizabin abah dizabin abah dizabin abah bitrei zuzei. Chad gadya, chad gadya, ve-ata kalba ve-nashakh le-shunra, de-akhlah le-gadya. 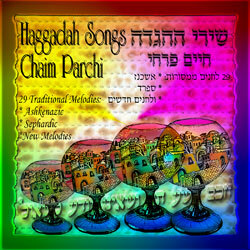 Echad Mi Yodea (אחד מי יודע) is a cumulative song meaning that each verse is built upon the previous one. There are thirteen verses in all. One is our God, in heaven and on earth. One is our God, in heaven and on earth……..